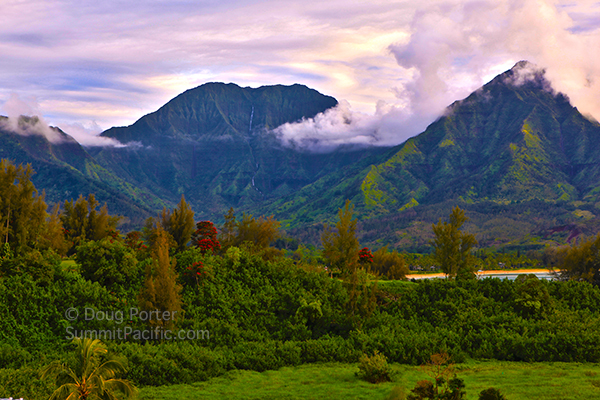 Viewed from Hanalei, the three most prominent mountain peaks are Hihimanu, Namolokama, and Mamalahoa. These are all part of a single ruggedly carved mountain ridge running down from Waialeale at the center of the island. From here they appear as separate mountains although they are more accurately peaks along the larger ridge. From Hanalei, Hihimanu is on the east (left), Namolokama is in the middle with its square top, and the triangular shaped Mamalahoa is to the west (right). This range is often misted by clouds and dozens of waterfalls cascade from Namolokama and Mamalahoa when it rains. Namolokama is 4421 feet tall (1348 meters) and has a flat top that makes it look a little like the leading edge of a manta ray swimming up to the sky. Its shape and flat top catches a great deal of rain and depending upon how hard it's raining on top, dozens of braided waterfalls can be seen cascading down from above, the largest of which splits the mountain in two as if coming down the center of the manta ray's back. Hihimanu to the east has two peaks which also look, to some perhaps, like the "wing tips" of a ray gliding along the surface of the ocean. I've hiked this ridge at sunrise. The trail along the razor edge of this ridge offers stunning views of Kilauea, the town of Hanalei, Hanalei Bay and of the other peaks to the south and west. Mamalahoa is 3745 feet (1141 meters) tall and forms a beautiful pyramid shaped peak, the north foot of which extends to Hanalei Bay. It also develops a dozen or so waterfalls when rain clouds move over its top. The above picture was taken from Hanalei Bay Resort.